This week our friends at Simply Youth Ministry are giving an exclusive gift to Life In Student Ministry readers! For the next 7 days, you can download their ice breaker product, Race This, completely free! No sign-ups, to mailing lists to join, nothing. Just click-and-download goodness! It’s easy to grab your students’ attention with Race This. It’s a brand new collection of 10 random ending “Dot Race” style races. When the race shows up on screen, students pick a racer and then cheer it on and hope for victory! You’ve seen races like this on the jumbo screen at sporting events, and now you can bring the fun straight to your students. Race This is a fun and effective way to kick off your program, meeting, or wrap up free time or small group sharing. Use Race This as an official part of your program or a fun way to pass the time before it starts. For more information on how these games work, check out the product’s description page. 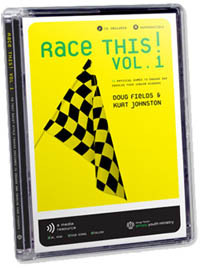 And, if you like it, there’s Race This Vol. 2 for download , as well, currently for 35% off! Also check out all the other great Media + Programming Resources they have for youth ministry. NOTE: This file is 1.9 GB in size, so be prepared for it to take a while if you’re on a slow connection. *This download is good for the next 7 days only. It expires on Thursday, October 27, 2011, at 11:59pm central time.